Blenheim Palace is inviting visitors to take a privileged peek inside the Private Apartments which have been lived in by the Dukes and Duchesses of Marlborough for more than 300 years. The guided tours of some of the Palace’s most opulent and luxurious rooms provide an exclusive ‘behind the scenes’ look at life in this stunning Oxfordshire UNESCO World Heritage Site. 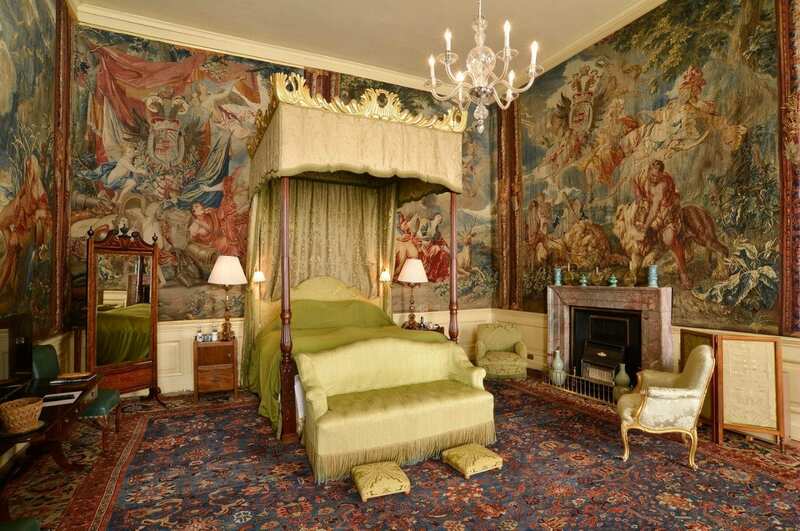 Normally off-limits to visitors, the rooms provide a fascinating insight into family life at the Palace with their mix of precious antiques, tapestries and artworks amongst modern items and family photos. The ‘Upstairs’ Tour takes visitors on an exclusive tour of the rooms where the Marlborough family and their illustrious guests have stayed over the past 300 years. Previous guests have included Queen Mary, King Edward VIII and Wallis Simpson, as well as Cecil Beaton and Yves Saint Laurent. Gain an insight into the daily routine of a guest at Blenheim Palace both past and present: what has changed and what remains the same? Find out why the dressing rooms have single beds in them, what’s the difference between ladies and gentlemen when it comes to breakfast and discover the quickest way to get a full laundry basket from the top floor down to the laundry in the Undercroft. The tour includes the Duke’s Entrance through the Undercroft, Duke’s Dressing Room and Bedroom, Bow Window Room, Smoking Room, Duchess’ Sitting Room, the Nursery, Font Rooms, Tower Rooms, Bachelor Rooms, Servants’ Staircase and, twice a day, the opportunity to see the beautiful Grand Cabinet* with its stunning collection of furniture, art and artefacts. Visitors will be able to discover family rooms such as the Blandford Bedroom, the Sunderland Dressing Room and Bachelors’ Row, which includes secret corridors, interlinking doors and spiral staircases. Please note this tour is not suitable for young children or school groups. There is a climb of the spiral staircase with 75 steps involved, therefore this tour is not accessible for wheelchair users and others who may find difficulty in this. Downstairs Tour gives visitors a glimpse into the lives of Palace staff over the centuries. Household staff were essential to the aristocratic way of life. Visitors can wander through the network of corridors and see the areas which are still in use by Palace staff today, including the kitchen. Guests will see what it takes to keep a Palace running from organising shoots to preparing the family’s luggage for travel to getting a soufflé from the kitchen to the Saloon without it falling! Learn about the bell board, a series of bells connected to various rooms around the palace to alert the butler, housekeeper and their teams to the requirements of family and guests; all different sizes so that skilled butlers and footmen could identify the bell by its tone without having to look. Rooms on the tour include – The kitchen, laundry, butler’s pantry & boot room, billiard room and china room where building work on the Palace began on June 18th, 1705 and peer inside the vault where many of the most valuable pieces of the Palace collection are secured. Guests will also be introduced to the mystery of the 8th Duke’s (‘The Wicked Duke’s’) Laboratory, it has a bell dedicated to it, but no one knows where it was actually located. New for 2019 – Wine Cellars: See the private collection of wine and learn how it is selected, stored and served. Book in advance online or at the Welcome Desk or Great Hall on the day; Palace, Park and Gardens ticket is also required. *Grand Cabinet tours are available twice per day and not on every tour, check with staff for details.